Remember that couch? I think it's become my comfort zone these past weeks. I have been spending practically all my time in it. I write on the couch. I study on the couch. I even eat on the couch! Often, I find myself falling asleep while sitting on it. It's just that comfy! I am so glad that we got it, despite my initial misgivings. I am planning to go to the mall next weekend to look at furniture, though. I don't know, but I have been going through this retail therapy phase, and I feel like looking at stuff for the house. 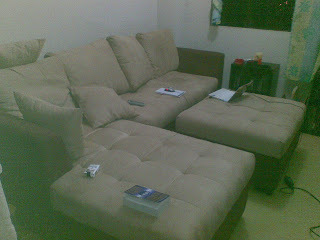 I am sure I will see a lot of modern sofas and couches, but I think I will not trade my trusty old just yet. What's your "comfort zone" at home?